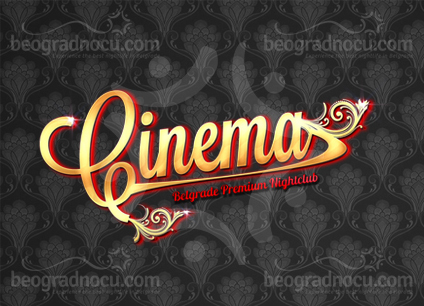 Club Cinema is one of the most popular night clubs in Belgrade. It is located in downtown, in No 18 Gracanička Street at Topličin Venac, near Obilićev Venac, Zeleni Venac and Knez Mihajlova Street. Otherwise, this part of town is known for nightspots. In this club have performed the most famous names of pop/rock scene of old Yugoslavia, like Severina, Neverne bebe, Miligram, Nina Badrić, Toni Cetinski, Vlado Georgiev, Kerber and many others. According to this list you can tell that club Cinema cherishes pop/rock genre in music with very professional artists and bends. This club works 5 days a week, which makes it one of the top clubs in Belgrade. The interior of this club prevails with extraordinary illumination, located in almost every wall, which gives a unique dose of originality. In Club Cinema you can consummate most various kinds of drinks, from delicious cocktails to the most exclusive champagnes. Of course, important part of this club is a friendly and professional staff, which is making your time in this club unforgettable. Club Cinema is a club exclusively for guest with average age 25+. Since this club is very popular, reservations for desired location in the club are desirable, day or two before. Especially on Wednesdays, that is a trade mark of club Cinema.